A great keyboard can have a lot of benefits especially for gamers that want to make the most of gaming. On the other hand, getting stuck with a bad keyboard can lead to a lot of wrist pain. Zebronics provides users with a budget friendly gaming keyboard that manages to stand out by offering high-end features at an affordable price. This Zebronics Max Pro is no exception. It offers a fine balance of features, reliability, and price making it a great first choice for most gamers that don’t want to empty their pockets. 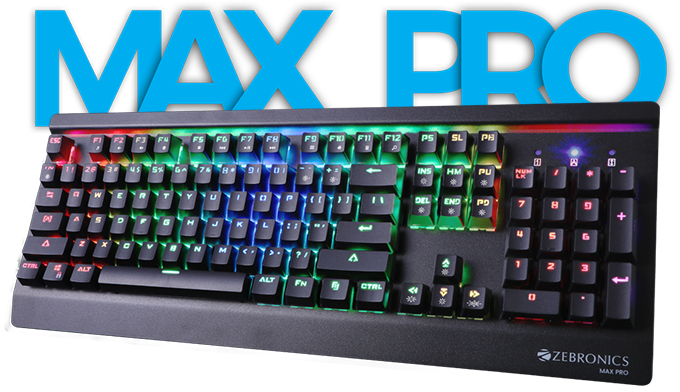 The Zebronics Max Pro is a heavy duty keyboard that’s made to last the test of time. The overall quality and durability of this mechanical keyboard is relatively high and offers exceptional performance when it comes down to its price. It weighs 1.3KGS which might be on the heavier side but considering it’s durability it does seem reasonable. It’s the perfect keyboard for prolonged gaming sessions and durable enough to withstand your gaming rage. The keys are expected to be pressed over 50,000,000 times and initial testing does prove that though the number might not be accurate it can definitely take a good beating. It features strong braided cables that use high quality USB connectors that make it even more reliable making it ideal for anyone looking to get a gaming keyboard that wants to make an investment that lasts a long time. With a full 104 keys with 12 numeric keys, this mechanical keyboard features a full lineup of keys that feature suspended and double injection keycaps. The keys are easy to remove allowing for easy switching down the line if the need ever arises. Each tap gives a tactile feel and acoustic feedback that feel rather satisfying. When typing or during a high octane gaming session, you can count on each press registering seamlessly thanks to the 1000Hz polling rate making it the perfect choice for gamers and workers alike. It helps you in achieving faster typing speeds letting you type faster without experiencing any input lag. 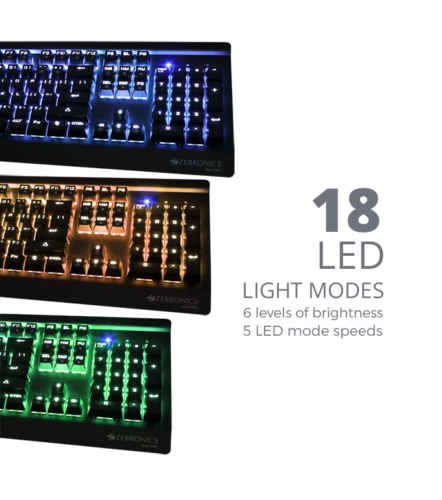 It features 18 LED light modes that can be individually mapped to each key making the keyboard as if basked in the color of the rainbow itself. You can also choose from a variety of pre-programmed color modes along with different brightness levels and transition speeds letting you style your keyboard to your heart’s content. Even besides the low price point, the switches work exceptionally great and maintain consistency no matter how long you type. The Zebronics Max Pro is an overall well rounded keyboard that offers most of the high-end feature which more expensive keyboard offer. While there may be a lack of certain features such as more hotkeys but considering its low price point of ₹3,999 available on Amazon it’s definitely worth a buy if you’re in the market for a reliable gaming keyboard.